What is this site about? The Checklist is useful for a personal to-do list, community agenda, and more. that helps me be more punctual . for that case i want maintain this ………………..
Hello, I tried to install this as per the instructions given, and I really thought I was doing it properly, but now the pages will not even come up. What I did was went to autonumbering in site manager, added the autonumbering and created the category, create the page "checklist", rename this page to "checklist:_template", then when I entered the "[[include :checklist-app:template]]" to the page, it kind of stalled. Now if I try to go to the page, it will not open. 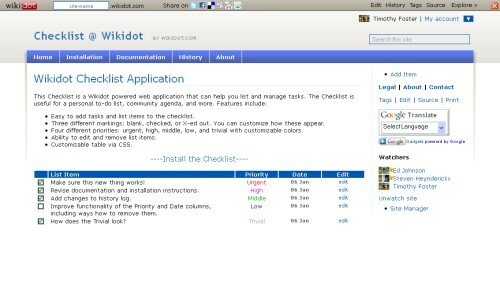 The documentation says you need a "checklist" page with this "name" (and not only the checklist:_template ) holding your personalised checklist or you rename it to your wishes and need than another include statement on the _template page with a variable [[include :checklist-app:template |destination=THE URL]] where THE URL equals your new (renamed) checklist page. The template page is used mainly for the purpose of directing the page back to the Checklist after a change has been made to it. The page has a special CSS definition that can make it difficult to edit if it ever needs to be edited. You need to append checklist:_template with "/edit/true/norender/true/redirect/true" to edit it! Otherwise the redirect cannot find the destionation place. Thank you very much for your help. I seem to have made a bit of a mess on my wiki, and am also finding that there is some kind of lag in the saving / searching for pages. Currently, I am going to delete everything, and wait for nothing to show up in my search, or when I try to make or rename a page, then I will try to re-do it following these instructions. In the meantime, I was able to install the calendar that you made, which is very nice. I will msg back here with the results from my checklist saga. I formulated a response, but didn't know how to resize the screenshots for this post. Please see this on my wiki at http://mgdev.wikidot.com/wiki:pics. Anyone else is welcome to come as well, if you wish. [[include :checklist-app:template]] ( which will be shown as dataform fields !) was wrong in this case ! Any "include" must be alone in a line ( except the varuiables) and at the end of the include statement there must be nothing else a linefeed/nextline. Pleasde correct the _template page ( or delete it and create it new..).. and tell us if this helps. You were right helmuti, the problem was the text [[include :checklist-app:template]] ( which will be shown as dataform fields !) in the checklist:_template page. That text after the include should not be there. As there were no permissions set on the page I removed the text and the app now works for GeoFruck. I'll have a look at the original site and see if that text can be deleted/moved/hidden. Edit: no I can't as I'm not an admin of that site. Timothy or someone will have to make the change so it doesn't trip anyone else up. haha, oh well, you identified the problem for him which was the main thing. For clarification, you go to the checklist page to actually view the checklist, check off items, make new items, etc. You do not need to look at the checklist:_template page anymore. That page simply allows the checklist to work. If, for some reason, trying to create a list item puts you on a blank page with a box in the top left corner, be sure to revisit this forum. Otherwise, I hope this app can be useful for the purposes of your site!